There is a nook created by the closet in the room (from which we removed the door and added shelving to make it more kid friendly). Take another look at that closet photo, people. That's real life. Messy is how my kids put away their clothes. At least they are learning to get the clothes off the floor. Ok, back to the nook. 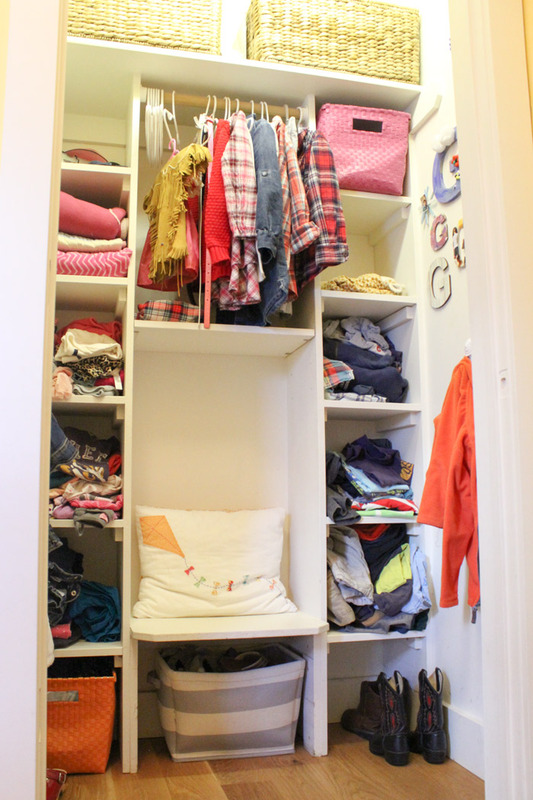 The nook is about five feet wide (the closet about four feet wide), which when you take out the closet and the bed, means there is approximately 20 square feet of useable space in this room. Yes, I double checked my math. 20 square feet of useable floor space for two kids. Whoa. This room is clearly an explosion of color. (The wallpaper is left over from the days when this was a laundry room. I loved it so much I couldn’t bear to paint over it or change it out.) Not everyone’s cup of tea, I totally get it. After years of wishing for Pinterest worthy kids’ rooms (it’s true – I am kind of obsessed with kids’ rooms and maybe also obsessed with bunk beds), I finally learned that kids really need to make their own space. This does not mean that you should paint every wall a different color in a shared bedroom when your kids can’t agree (I may know this from firsthand experience). But it does mean that letting kids make simple choices about bedding or how to store their toys will make your life a little easier and their life a little happier. In keeping with this theory, the twins have picked their own bedding and decorated their closets with initials that they have made themselves. We have magnet boards for them to hang their own art. Gus uses the shelf above his bed for all variety of knick-knacks, and Théa has a little corner in which dolls and stuffed animals sleep on a rotating basis. It works. Until you introduce something new. In this case, the something new was Hazel, Théa’s doll, and Hazel’s extensive collection of clothing, food, accessories, and shoes compliments of Santa, the grandparents, and our neighbor with an older daughter. I am totally digging this project. See you then!